But Emma, tiring of criticism, tossed her pretty head, flounced her voluminous skirts and went abroad, where she emerged as Lady Hamilton, one of history’s greatest romantic ladies and the beloved of England’s greatest naval hero, Lord Nelson. Lady Hamilton was the Scarlett O’Hara of her day when it came to furthering her own ambitions. 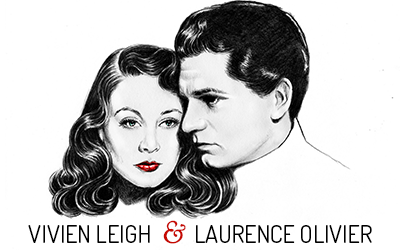 And appropriately enough, Vivien Leigh, whose name will always be linked with that of Scarlett, is now playing the woman whom Lord Nelson called “the dear Emma.” It’s one of the neatest bits of casting in years–especially when you consider that Vivien’s own husband, Laurence Olivier, plays Lord Nelson. Lady Hamilton is one of those superbly done Alexander Korda historical film romances (remember Charles Laughton in The Private Life of Henry VIII and Elizabeth Bergner in Catherine the Great? Korda produced and directed them, too) and will be brought to the screen with almost fanatical emphasis on accuracy. The English public (and there is one, in spite of European conflicts) doesn’t like its idols presented in a false light. Vivien Leigh is mighty happy about playing “the dear Emma.” She didn’t expect to get a part with quite as much Scarlett O’Hara oomph for some time. 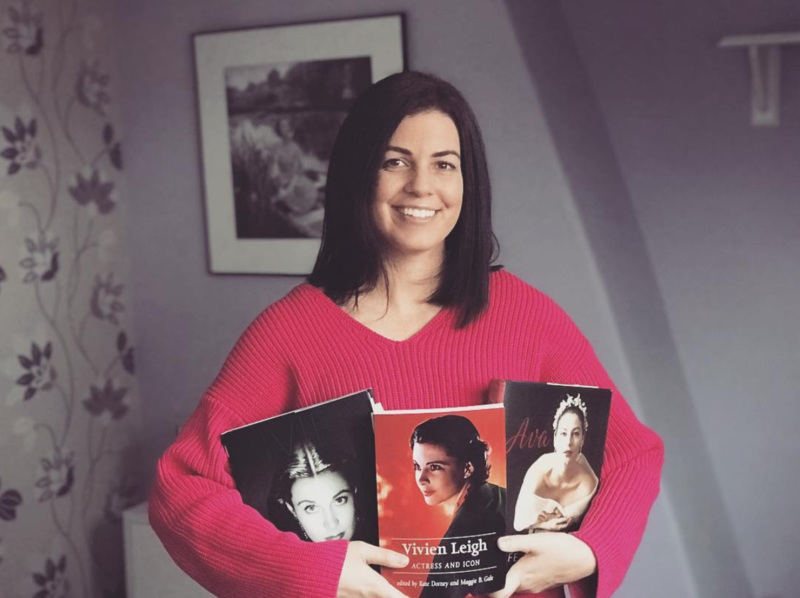 I had a wonderful time visiting Vivien and Laurence Olivier on the set of the picture–and brushing up on my English history. To begin with, I arrived right in the middle of one of their first big love scenes together–and the Oliviers were throwing sparks in all directions. Their love scenes will burn up the screen. Since I don’t know what the scene was all about, I was given the low-down on Lady Hamilton and Lord Nelson. The picture begins with Emma’s arrival in Naples in 1793, on a mission dear to her heart. She is in love with an aristocratic young Englishman (whose history records as rather a heel) and her mission is to persuade his uncle, the English Ambassador to Naples, to consent to their marraige. But poor Emma soon discovers that she’s been done wrong by. The elderly uncle, Sir William Hamilton, played by Alan Mowbray, reveals that his nephew hadn’t the slightest intention of marrying her. He’d given her the pitch. But Sir William himself fell desperately for the charms of the discarded mistress. Invited her and her mother, the redoubtable Mrs. Cadogan, to be his guests at the Embassy. Emma, like Scarlett O’Hara, when she couldn’t get the man she wanted, promptly married another. Just to spite everybody she got her lines and a wedding ring from Sir William and became Lady Hamilton, first lady of the English colony in Naples. In 1797, the painstaking Korda research department informs us, Emma was comparatively happy, tranquil in the love of her husband and secure in her close relationship with the Queen of Naples, the most powerful ruler in all of Italy. (The Queens husband, Ferdinand VI, was an amiable fuddy-duddy who was perfectly willing to let his wife run things.) But in 1797 Lady Hamilton first set her orbs on Captain Horatio Nelson, already famed in England for his naval triumphs against the French. And proceeded to add several pages to history. That’s where my particular love scene came in. After Nelson has destroyed the fleet of Napoleon, his health breaks completely and he returns to Naples where Lady Hamilton nurses him back to health. (He’s lost an eye and an arm, but to Laurence Olivier, it’s attractive!) At a reat ball given in his honor by Sir William and Lady Hamilton, Nelson and Emma finally admit their love. The scene is the loggia of the palace that serves as the Embassy. The entire city of Naples can be glimpsed below, with a smoking Vesuvius looming in the distance. It’s one of the most elaborate sets in recent movie history, and art director Vincent Korda, who handles all his brother’s pictures, will probably get a nod from the Academy of his work. Miss Leigh is leaning on the balcony, gazing at the twinkling lights below, when Mr. Olivier dashes out in search of her. When they open their mouths they become Lady Hamilton and Nelson. The bells stop suddenly and in the silence Miss Leigh and her husband go into a clinch that I can only hope Lady Hamilton and Lord Nelson were able to duplicate, if they were the great lovers that history claims them to be. When they come out of it, Olivier says, “Now I’ve kissed you through two centuries–” and they melt into each other’s arms once more. I was lucky to see this scene shot in its entirety. After a perfect long-shot there would be individual close-ups of the stars, a long and sometimes tedious process. But “Larry” Olivier kept things lively during his wife’s close-up! Seems he is very proud of the iron control shown by Miss Leigh when she’s acting. She’s one of those actresses who can’t be “broken up”–and naturally that’s a challenge for her husband to try to do it! During her close-ups that required Olivier’s presence on the other side of the camera for dialogue, he started popping into weird makeups and costumes–artfully timing his entrances so that she couldn’t see him until the scene had begun. But nary a twinkle from Vivien, once she had started her scene. Afterword, of course, she would go into gales of laughter. Hollywood reporters generally make a bee-line to Alan Mowbray’s set, because he’s one of the most amusing chaps in Hollywood, with the funniest flock of anecdotes on record. Alan gets away from his usual comedy roles in Lady Hamilton–and I think he will surprise those of you who think of him only as a screwball comedian. before casting his lot with the movies and becoming a comedian, Mowbray was one of the most distinguished actors on the London and New York stages. He found himself right at home in the Korda picture, with its practically all-English cast. Many of his fellow players were also closely associated with the Hollywood British relief Fund, and they would carry on a lot of business between scenes. But the shadow of war hung over the set constantly. Vivien Leigh was handed some mail one afternoon, just before going into a scene. She tore open a letter and when the assistant director said “All ready, Miss Leigh,” looked at him blankly and didn’t reply. Clutching her half-read letter she rushed to her dressing room, leaving the troupe in quite a state of confusion. Larry Olivier followed, of course, and found his wife in tears. She had just read of the death in action of her ex-brother-in-law, a very good friend. I’ll tell you a little secret about Vivien. She has one of the most enchanting smiles in the world, as you’ll remember from Gone with the Wind. And although she smiles too in Lady Hamilton, you’ll never guess it from the pictures in the magazines. She hates smiling pictures of herself. Even when she was persuaded to pose for a special group of happy poses for the camera of Robert Coburn, showing those little girl dimples, she couldn’t be persuaded to okay any of them. “I told you I wouldn’t like them,” she said sadly to photographer Coburn. “But it’s my face–and I don’t like it smiling!” And she calmly tore the corners off the pictures, which means NOT APPROVED BY THE STAR. Henry Wilcoxon, that rugged Britisher, plays the important role of Nelson’s aide, Hardy. His fans will agree that it’s just about time for a good role for Henry. He, too, is a tireless worker for the British relief. His wife, the lovely actress Joan Woodbury (who is also a professional dancer) created new conga type dance called the Bajun, which the Wilcoxons introduced at a big benefit. The Queen of Naples is played by Norma Drury, whose name will be familiar to you, we wager, after Lady Hamilton. A stunning brunette, Miss Drury has been doing bits until Producer Korda decided she was worthy of better things. Drury is a concert pianist, and looks like a dark edition of Ann Harding. Luis Alberni, that brilliant comedian, plays the King of Naples. Then there are Halliwell Hobbes, Ronald Sinclair, Gilbert Emery, Juliette Compton, Guy Kingsford and half of Hollywood’s English colony in supporting roles. I told you Olivier played Lord Nelson as his one-eyed, one-armed counterpart (except for the first scenes). But he’s the most dashing figure of a one-eyed man you’ve ever seen, with a narrow black band draped around his blind eye. At least he won’t have any difficulty convincing the girls that he deserves to be known as one of history’s great lovers. Nor Vivien Leigh that Emma Hamilton was the great beauty legend has made her! Whether it’s history or romance that thrills you, chances are that Lady Hamilton will be just what the doctor ordered. I’ve got my order in for preview tickets already!